You want to learn How to attract hummingbirds? its not rocket science. There are several easy requirements to transforming your back yard or neighborhood bird habitat into a home for ruby-throated hummingbirds. They require a rich diet consisting of insects and nectar, and some trees for resting, nesting and hiding. Ideal ruby-throated hummingbird habitats would have both mature hardwoods and meadows, gardens, wetlands, shrubs and riparian areas. Many residential and rural areas actually present a perfect mix of these different habitat types. In this How to attract hummingbirds article we will provide several tips for making your back yard and neighborhood even more attractive to hummingbirds. The biggest secret to attracting hummingbirds is actually quite easy – provide them with their required food source. 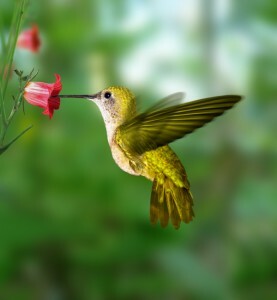 Although most of us believe that hummingbirds only eat nectar, this is not the case. The most important source of protein for adult and young hummingbirds is insects and other invertebrates. An adult bird can consume up to two thousand insects every day. A large portion of their diet consists of other small invertebrates such as gnats, mosquitoes, fruit flies, spiders, small bees, caterpillars, aphids and insect eggs. In the wild, insects are attracted to weedy patches consisting of taller grasses and forbs (non-woody broadleaf plants). Ample insect population can be found in some designed wildflower gardens, but the best insect habitats are naturalized areas with a lot of native forbs and grasses. Hummingbirds will mostly seek out insects in those naturalized areas, but are also used to searching walls, bricks and cliffs for insects, going so far as to steal them from spider webs. In case you live in rural areas or own a secluded back yard, developing a home-made insect habitat without great expense can be as easy as tilling a small area of your yard and leaving it fallow for several years. Another cheap and effective way is by simply not mowing a portion of your lawn. However, before starting, you should check your local ordinances and weed laws because some neighborhoods prohibit such practices. As is the case with any landscaping in your back yard, these naturalized areas should be presented in a visually pleasing manner, both for you and your neighbors. Try to integrate them into the whole of the back yard so they do not stand out too much. Another way is to clearly visually separate those areas and so make them more attractive and acceptable. You could mow a clear border around them, surround them with a small fence, pave a path through them or plant some flower beds around. Combine a few of these ideas and make the insect habitat in your yard aesthetically pleasing. Abundant insect populations can thrive in native wildflower gardens and flowering trees and shrubs. Those can be welcome additions to any back yards while still providing you the needed structure for insects. You can combine the practices recommended above and mark clear boundaries of your flower beds. Some of the species which attract a lot of insects and still look beautiful in any garden are the purple coneflower (Echinacea purpurea) and bee balm (Monarda Didyma). Below are some other flower species you can chose, which will not only attract insects but will also provide nectar for hummingbirds and butterflies. As hummingbirds have a very high metabolic rate, enabling them to fly at the speed of 27 mph with an average of 53 wing beats per second, they require a lot of high energy food. And adult hummingbird has to ingest their own bodyweight (3 grams) of nectar daily. They feed throughout the day in intervals ranging from 5 minutes to 1 hour. This essential part of their diet can be obtained from two sources – flowers or artificial nectar feeders. This is why various flowers planted in and around your yard are so valuable, because they provide the hummingbirds with nectar. Hummingbirds, rather than bees, are involved in pollinating almost 150 species of plants. These specific species are less attractive to pollinating insects because of the color and structure of their flowers. For example, bees do not perceive red color, so many of the hummingbird pollinated flowers are red in color. Also, flowers which attract hummingbirds have no perching platforms like many other flowers, but are often pointed downward and have long corolla tubes which make it impossible for insects to feed. If you plant a mix of flowers and shrubs with different blooming seasons you will provide the visiting hummingbirds a continuous source of nectar throughout the growing season. Several publications in the references section will provide you with a detailed list of plants for hummingbirds. But to get you started we have prepared a short guide. How to Attract Hummingbirds with plants. Shrubs: the most common species used as sources of nectar for hummingbirds are deciduous azaleas (Rhododendron spp. ), pepperbush (Clethra spp. ), rhododendrons (Rhododendron spp.) and rose mallow (Hibiscus moscheustos). Perennials: there are numerous species but some of the most common are bee-balm, phlox (Phlox spp. ), columbine (Aquilegia canadensis), Copper or red iris (Iris fulva), red morning glory (Ipomoea coccinea), foxglove (Agalinas spp. ), skullcap (Scutellaria spp. ), lilies (Lilium spp. ), beardtongue (Penstemon spp. ), cardinal flower (Lobelia cardinalis), gayfeather (Liatris spp. ), fire-pink (Silene virginica), scarlet sage (Salvia coccinea) and royal catchfly (Silene regia). Annuals: some of the species attractive to hummingbirds are Mexican sunflowers (Tithonia spp. ), flowering tobacco (Nicotania spp. ), snapdragons (Antirrhinum spp. ), pinks (Dianthus spp. ), scarlet sage (Salvia coccinea), zinnia (Zinnia elegans) and jewelweed (Impatiens capensis). You can provide visiting hummingbirds with nectar by using artificial feeders. Those feeders can hold enough nectar to imitate anywhere from 2000 to 5000 flowers. Nectar feeders can also be a key focal point because you will always know where to look to find your visiting hummingbirds. Feeders are also a valuable solution for early in the growing season when flowers mostly haven’t yet blossomed. This is especially important because it provides required energy for hummingbirds which are going to reproduce. The feeders can also come in handy as supplementation to natural nectar sources if there is a gap between blooming seasons of your flowers. In the fall, feeders again become a crucial element because hummingbirds need to gain weight in preparation of their long winter migration. Before the migration starts, the birds will almost double their bodyweight, going from 0.1-0.12 ounces to 0.19-0.22 ounces. The additional weight will be needed as sustenance for their 20 hours long trans-gulf migration. When choosing the nectar feeder, pay attention that you purchase a model which is easy to clean. Red color will work for attracting the hummingbirds and at the same time it will not be attractive to insects. Also make sure that the wasp and hornet guards on the feeder are red and not yellow (honey bees almost never come to nectar feeders). Another important factor is the proper placement of your feeder. Try to find a shaded area that still provides enough open space for hummingbirds to fly around the feeder. The shade is important because it keeps the nectar cool in the summer heat meaning it will last longer. Keep in mind that hummingbirds are territorial creatures. Dominant males will tend to fight other males for the feeder he considers his own. Because of this, if you want a larger number of hummingbirds, you should use several feeders, spaced at least 10-15 feet apart. When the number of birds per feeder reaches 4, or you see males chasing each other, it is time to add another feeder. You may be surprised how many hummingbirds you will attract with enough feeders. Between feeding, hummingbirds need their rest, so try to place the feeders close to trees or perching areas. This way they will not have to travel between their feeding and resting places. Also, nearby perches can serve as a place to wait their turn at feeding. If you place ripe fruit close to the feeders it will make the feeder more attractive and at the same time serve to attract insects which are the second food source for the hummingbirds. If the birds are not regularly draining all the nectar in your feeders, you should change it every 3-4 days. This way the nectar will not ferment or become rancid. Also, every week you should dismantle the feeder and thoroughly clean it with soap and water followed by a vinegar rinse. That way you’re keeping your birds disease free. If you develop an ant problem on your feeders, never use insecticides because they could harm the birds. Rather, install water filled ant guards which will keep ants away. You can also make your own nectar solution by dissolving 1 part sugar in 4 parts of water. The solution should be boiled for a couple of minutes to reduce fermentation, but do not use the microwave because it will break the sugar molecules and change their nutritional value. This mixture can be kept in the fridge and used to fill up the feeders. Especially if you have red feeders, feel free to use this sugar water, but never add food coloring, sweeteners or honey to the mix because they might cause the hummingbirds to have health issues. You can also purchase nectar online Perky-Pet 238 Hummingbird Nectar, 32-Ounce Concentrate This is a good way to attract hummingbirds if you don’t want to plant a garden. In the fall, you can leave the feeder out as long as the birds keep coming to it without fear that it will delay their migration. Leaving them outside even after your local birds have left is also a good idea because they will serve those migratory hummingbirds which are passing through. Also, you might attract several new species of hummingbirds which have been coming to Indiana for the past few years. On various places in Indiana there have been sightings of two species of Selasphorus hummingbirds (Rufous and Allen’s). As ruby-throated hummingbirds are primarily a woodland species, they really need some mature trees to have a complete habitat. They use trees for nesting and rest. Also, areas with woodland patches or yards and gardens with mature hardwood trees between them will provide the additional insect food source for hummingbirds. Various ponds, streams or wetland areas can also serve to increase hummingbird population because they present an abundant source of insects. Ruby-throated hummingbirds usually nest on small braches of deciduous trees about 10-20 feet above the ground. They prefer crafting nests in isolated and undisturbed forests, and have a tendency to return to their nests every year, rebuilding it if it was destroyed. They construct their nests from milkweed, thistle and dandelion down with segments of moss, fern and young leaves. They attach these materials to the branch using spider webbing and tree sap, finishing the nest with camouflage made from lichens which grow on the nest tree and other trees around it. You can provide the birds with these materials by putting them in your flower beds or back yard. Like all small birds, hummingbirds are faced with numerous predators among which are snakes, the praying mantis, blue jays and crows (nest predators), but also toads and frogs. However, their most dangerous predator is the domestic cat. Since we provide the birds with food at specific locations like flowerbeds and feeders, this also makes those locations excellent hunting ground for the cats. In general, cats should never be allowed to wander unchecked because they are harmful to many wildlife species such as birds, small reptiles, amphibians and mammals.